In August 2015, Aqua received North Carolina Utilities Commission approval for its water and wastewater system improvement charge. 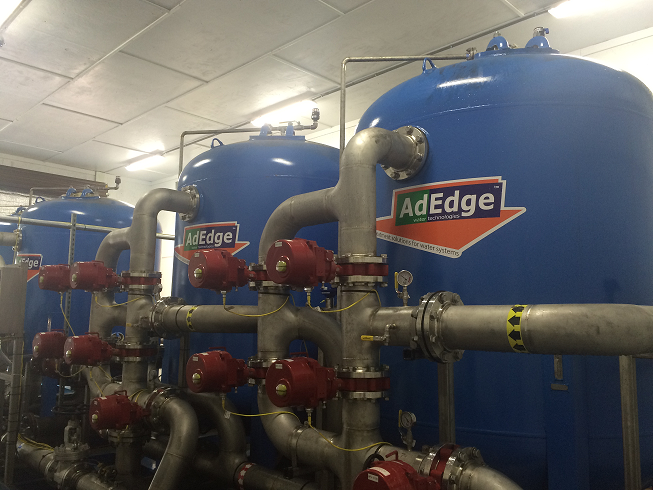 This allowed Aqua to accelerate distribution system and water treatment improvements for our customers. The company used this as an opportunity to speed up the installation of filtration projects on wells that needed them, in turn, reducing customer dissatisfaction due to discolored water caused by naturally occurring iron and manganese. Since that time, Aqua has completed 24 filter projects on wells that need them. The company is planning for the installation of an additional eight filters during 2018. Since iron and manganese is such a pervasive issue in North Carolina, the ongoing challenge Aqua has faced is how to standardize our approach so projects can be completed in a more systematic way. Throughout 2017, we began discussing our options and laying the groundwork for a more streamlined process. Group 1 – these are sites where the combined total of iron and manganese in the water is above 1 milligram per liter or there is greater than 0.3 milligrams per liter of manganese. These locations will require filtration and these projects will be prioritized first. Our goal is to install new filtration treatment within a reasonable timeline; the wells that need it most will see filters within the next three to five years. In the interim, we will employ an aggressive tank cleaning and system flushing program in communities served by these wells. Group 2 – these are sites where iron in the water measures at or greater than 0.6 milligrams per liter and manganese measures at or greater than 0.1 milligrams per liter. In some instances, the company may install filtration on these systems, but in a majority of cases, we will look to employ mineral sequestration by adding a certified drinking water corrosion control sequestrant that will suspend the oxidation process and keep the iron and manganese in its colorless state. We will also employ an ongoing system flushing program. Group 3 – these are sites where iron in the water measures at or greater than 0.3 milligrams per liter or manganese measures at or greater than 0.05 milligrams per liter. Here, we will look toward mineral sequestration in most cases, and employ flushing operations as needed. Group 4 – these are sites where iron in the water measures at or less than 0.3 milligrams per liter or manganese measures at or less than 0.05 milligrams per liter. These locations should be part of an annual system flushing program, but should not require filtration or mineral sequestration. Prior to beginning any project, we will reach out to communities where we will complete work to keep customers informed of our plans. All systems will be monitored on an ongoing basis to help ensure safety and overall quality of the water source. We will also employ an aggressive water quality operations plan to help make sure water consistently flows clear. That will mean an increase in scheduled system flushing in many communities and a robust tank-cleaning program that spans our operation across the state. We will continue to use our Aqua alert mechanism (a call, email, and/or text) to announce system flushing events in communities we serve. If you have not already, please sign up to receive these alerts by clicking here. There are things you can do to help improve the quality of water coming into your home. First, if you have a conventional hot water heater, you should flush it out on an annual basis or as recommended by the manufacturer. Also, when Aqua schedules a flushing event, it is important that you limit your use of water for that period of time. If you notice discolored water following a flushing event, always go to your outdoor spigots and run the tap for a short period of time. If this does not clear your water, please contact us at 877.987.2782. One of our technicians will visit your home, take a water sample and perform additional flushing of the water main if necessary.